SYSTEMATURGY. Actions, devices and drawings. The central issue of the exhibition are Marcel·lí Antúnez Roca’s actions and the methods followed to produce them: the Systematurgy. This neologism was created by the artist in the 90’s and it is understood as the dramaturgy produced by computational systems. This procedure affects the creative process and the representation of his works. The Systematurgy combines, among others, audiovisual elements, corporal interfaces and robotic elements that are used interactively during the performances and installations. The exposition, placed on the 2nd floor of Arts Santa Mònica, is organized in four areas: Process space, Installations, Devices and Stage. The first area shows certain types of drawings used as elements of the creative process, the second works as a playroom, where we can interact with seven different installations. On the third area, Devices, we can see and activate robots and corporal interfaces; these are all physical prototypes of Systematurgy. The last area, Stage, is where the performances will take place once a week on the Claustre space. We will be able to see the most relevant performances of the artist: Epizoo, Afàsia, Protomembrana, Hipermembrana and Pseudo. Complementary activities will also take place here with collaborations of special guests who have joined Marcel·lí’s path over these years. This area has another spot on the second floor with some documents like books, catalogues, posters and the documentary El Dibuixant. Beyond technical matters, Systematurgy is the utopian intend of organizing the materials and the creative universe that surround the artist. 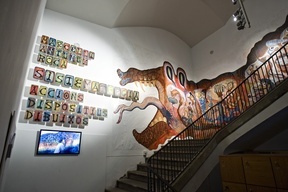 This is the intention of the Site Specific work, the SADDi wall that fills the six flights of stairs and will be finished during the first two weeks of exposition. Booklet photo: Carles Rodríguez, Darius Koelli i Oriol Ibàñez. Assistants: David Andrés Tangarife, Marc Arumí, Yansi Soler, Lucía Egaña, Max Dalmau, Klaus Speis, Paloma Bomé, Laura Sancho i Moisès Fernández. 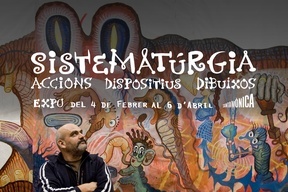 Produced by Arts Santa Mònica and Panspèrmia SL.